Credit card fraud costs businesses billions of dollars every year and creates headaches for consumers whose account information is stolen. When a friend of a friend begs to borrow a credit card in a pinch, it's natural to want to score points for being nice. But experts advise against lending your credit card to anyone. If you really want to help, handle the transaction yourself . Identity theft victims personally knew those who misused their personal information in 16 percent of all ID theft cases, according to Federal Trade Commission survey reports. It's OK to throw away new credit card offers you don't want and old credit card statements--but not before shredding them. Some thieves make their livelihoods by stealing financial information from the trash. 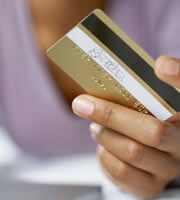 Shred credit card offers and all documents containing your credit card account information. An email that says it's from your credit card company asks you to click on a link to update your account information. The logo looks legitimate, but the message is a scam, designed to steal your account number. Don't give out your credit card information to telephone solicitors or in response to any e-mails. Letting waiters handle your credit card transaction while you stay at the table is convenient, but what if the server is really a scoundrel in disguise? Portable skimmers--handheld electronic devices that capture credit card information in the time it takes to swipe the card--are cheap and available online for purchase. All it takes is one dishonest waiter to compromise your account information if you're not careful. It's OK to use the public computer in a hotel lobby to search for a nearby shopping center, but don't use it to charge purchases. Your browsing history and login information could be accessible to those who use the computer after you. Also, avoid shopping on unsecured wireless networks because hackers can get hold of your payment information. Use your home computer and secure Internet connection instead. 0 Responses to "Inviting Credit Card Fraud: Five Dumb--and Common--Mistakes that Make You a Potential Victim"